Ashington FC joint manager Tom Wade believes the side will get better after they made it two wins and a draw from their opening three fixtures with a 2-0 win over Team Northumbria at Woodhorn Lane on Saturday. Wade said: “We played some decent football at times but we are still lacking a bit of self-belief, which will come through time. “They [Team Northumbria] had probably one header second half so defensively we did exceptionally well. “We are unbeaten in three games, not because we are playing great football but because we are working hard. “We are not playing the way Steve [Harmison] and myself want but that too will come. “We have got good players here and things will take a bit of time to gel. “Kyle [Downey] scored with a great free kick then, to be honest, I thought we got a lucky penalty award where we were able to make it 2-0. The Wansbeck outfit go to Heritage Park on Wednesday night to face a Bishop Auckland side who have appointed Colin Myers as temporary manager following Steve Riley’s decision to resign last week, and Wade knows nobody better in footballing circles than Myers. “It will be a tough game on Wednesday,” he said. 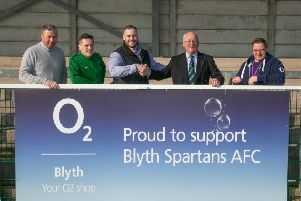 “Colin Myers was my assistant at Blyth Spartans and he did exceptionally well. “I spoke to him to send him my best wishes. Turning his attentions to Ashington’s FA Cup preliminary round clash at Sunderland RCA on Saturday, Wade said: “RCA are a very good side. Colin Larkin is an exceptionally talented forward and they have got some other excellent players. “It’s early days in the season and we are an unknown quantity at the moment because opposing teams don’t know how to play us. Wade will focus on his own squad rather than on his opponents. “I know most of the RCA players and our centre back Wayne Buchanan played for them,” he said.